Meeting Your Half-Orange – Watch the Happiest Video About Happiness Ever! If you want more love and bliss and happiness in your life, I have a simple secret I want to share with you that can help you get it. If you have two minutes, find out a profoundly simple secret about how happiness really works. 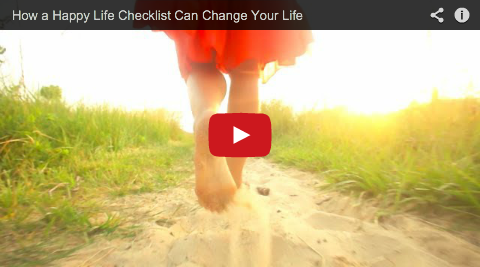 Find out how a happy life checklist can change your life, and you can feel happier instantly. As in today, right now. And if you’re inspired by the video and want more ideas on how to savor the small moments of happiness every day—in areas of love, grace, confidence, vitality and delight among others, for a life of true, balance and bliss—grab the book that inspired it today! Buy The Happy Life Checklist: 654 Ways To Find Your Bliss on Amazon.com.